Your watercraft may be designed for water-oriented pursuits; however, that doesn’t mean storage on the water at a marina or dock is the best option for your boat. Dry storage out of the water may be the best way to store your boating beauty when you’re not out enjoying Southern California’s stunning natural charms. Your boat offers access to parts of lakes and the coastline that can’t be reached otherwise. You also have easy access to the Inland Empire’s largest recreational vehicle storage facility of its kind. Vines Storage offers secure indoor boat storage service in Redlands CA. You can also choose from secure outdoor sites. Either way, one of the most significant investments you’ll make in your life is protected from the very elements that make SoCal such a great recreational and tourist destination: sunlight and year-round heat. When other parts of the country are digging themselves out of feet of snow, we’re out enjoying the great outdoors. Ice and frigid temperatures may prematurely age watercraft elsewhere. Here the greater threat to your boat comes from sunlight-related wear and tear. 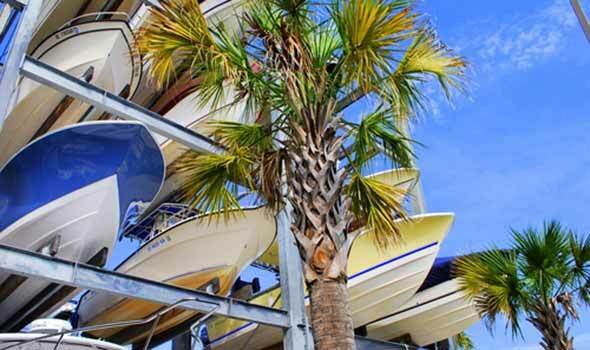 Dirt and grime can quickly build up on boats stored at a dock or marina. When combined with ultraviolet light from the sun’s rays, and other outdoor elements (such as bird droppings), watercraft can sustain significant damage. Fiberglass, rubber, plastic, vinyl and other exposed materials and components may all require repair or replacement. For instance, soft and flexible vinyl can become dry, cracked, and flaky when exposed to prolonged UV light. If the damage is severe enough, costly replacement may be in order. The easiest sun protection for your boat comes courtesy of enclosed storage. 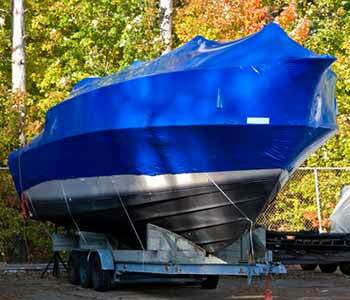 At Vines Storage, you don’t have to tediously cover and uncover your boat. Spend less time on maintenance and more time enjoying your investment. Consider how boats in the water tend to grow grass on their bottoms. In these situations, expensive antifouling paint is needed to prevent marine organisms and plant life from attaching themselves to the hull. Indoor storage prevents damage that requires repairs and minimizes the need for time-consuming and expensive upkeep. When you do need to repair your watercraft or perform routine maintenance, Vines Storage has made it headache-free to do so with generous floor space. You can access your boat without any hassles. Other indoor storage facilities in the Inland Empire may only offer rack storage. Boats are stacked one on top of another, many feet high. Vines Storage doesn’t have to stack boats, because there is plenty of space for your watercraft. The facility used to be a warehouse, so we can accommodate everything from a fishing vessel to a yacht. You’re not at the mercy of the storage facility’s hours; access your boat on your time – early in the morning or late at night. If you have an older or wooden boat, there is no worry about damage resulting from the craft being lifted or stacked. The seams stay intact, avoiding leaks, and the hull doesn’t warp. Enclosed spaces are often more affordable than traditional wet dockage. Payment options fit your needs. You may choose from flexible month-to-month or long-term leasing. Vines Storage also offers many amenities onsite to make tinkering with your boat easy. The facility also protects against your fellow man! Wet docks and marinas can leave your boat vulnerable to thieves and vandals. Vines Storage uses a multi-layered system. Only our clients can access the entrance to our property. The facility is also protected by a cinderblock wall. Our 24-7 security professional lives onsite, and we have dozens of surveillance cameras watching our property around the clock. Indoor storage may be the superior way to store your watercraft. Yet, not all indoor facilities in and around Redlands CA are the same. These and many other features mentioned here and available at Vines Storage, help to keep your boat performing and looking as great as the day you got it. Quality storage is a great way to retain your boat’s resale value and many years of enjoyment for you and your family. Call 909-389-6209 to reserve a space today!